Oscar Nunez perhaps best known for his role as accountant "Oscar Martinez" on the US version of the hit television comedy series The Office has teamed up with Cruelty Free International to tell the United States that #ItsTime to match the European Union in ending cosmetics testing on animals. 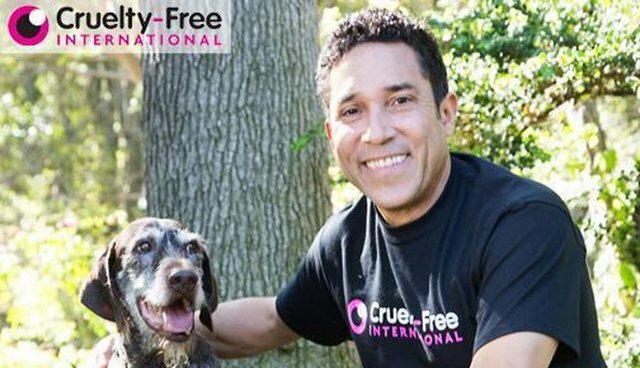 "I am proud to join Cruelty Free International in urging the United States to end cosmetics testing on animals" said Oscar Nunez who posed for a photo shoot with Cruelty Free International along with his rescue dog Gus. This week marks the second anniversary of the historic ban on the marketing of new animal-tested cosmetics in the European Union which went into full effect on March 11, 2013. Oscar joins the star of the original UK version of The Office, Ricky Gervais in supporting Cruelty Free International. Ricky s is an Ambassador for Cruelty Free International and starred in the organization's global campaign launch video. Chief Executive of Cruelty Free International, Michelle Thew, said, "Following our success in achieving a ban on animal testing for cosmetics in the European Union, Cruelty Free International has been rolling out a program for change across the globe with exciting results. It's time for the United States to match global progress on this issue." India now has a testing and sales ban in place while Brazil, New Zealand and South Korea recently made significant strides toward ending animal testing via legislation or policy decisions. Vietnam has agreed to end animal eye and skin irritation tests and there has also been promising changes in China's acceptance of non-animal tests for regular cosmetic products manufactured in the country. "Most Americans are completely unaware that the US still allows cruel tests for cosmetics, even though humane non-animal tests are available. We are so thankful to have celebrities like Oscar Nunez to help bring this information into the public attention," says, Monica Engebretson, Cruelty Free International's North America Campaign Manager.